It all started for Handelsonderneming C.J. Klep in 1994 as a dealer of the well-known peat bales. Nowadays the grower has much more choice and the assortment with substrate mixtures offered by Klep has grown considerably. In order to make it more prominent, Klep has been marketing the substrates under the Substraat Optimaal brand since 1 January. Although Klep has long been an established name, especially in the southwest of the Netherlands and in large parts of Belgium, the trading company now can tick off all the Dutch provinces with the exception of Groningen, in terms of substrate delivery. 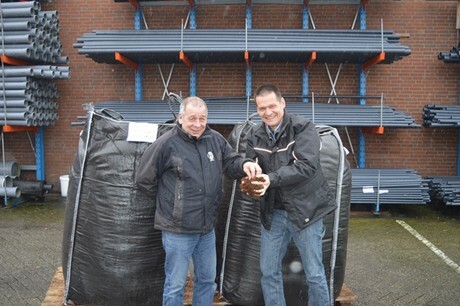 The expansion of soft fruit cultivation throughout the Netherlands benefits the company. "When growers ask which substrate mixtures we sell, my answer is always: your mixture", says Nol Jochems, substrate specialist for strawberries and tray plants. "In principle we can make all possible mixtures, but of course it all has to be justified. We also provide advice for this." Substrate Optimaal includes all known fixed mixtures of Klep, with for example, Strawberry Stable or Vegetable Peat for greenhouse vegetable cultivation. Sometimes such a substrate may contain up to ten different raw materials. All kinds of tests precede the creation of such a mixture, as Wim Voogt explains. Just like Nol, he occupies himself with substrates and gives advice to growers for both soft fruit cultivation under glass and greenhouse vegetable cultivation. "With new mixtures it starts with a test on a number of square meters, and eventually it will be scaled up to, for example, a whole tap section." It may take up to three years before a new mixture is suitable for marketing. "The influence of the mixture on the crop may reveal itself at the beginning or only at the end of cultivation. You have to figure that out first." At Klep, only one person occupies himself fulltime with R & D, but Nol and Wim also conduct tests themselves to compile the most optimal mixtures. Mixtures are eventually compiled at Van Egmond Potgrond. The company is based in Amsterdam, quite a distance from Etten-Leur. Yet that actually only has advantages, according to them. "From Amsterdam, the Netherlands and Belgium are easily accessible and it saves transport costs, because the raw materials do not have to be transported separately to us first." All mixing is done in Amsterdam. "Van Egmond has its own unloading ramp at the port where all the components come in. As a result, you are immediately a step closer to the source, often the peat areas in the Baltic States and Ireland where many raw materials come from. Van Egmond makes exactly those mixtures that we pass on to them in consultation with our customers. And because Van Egmond, like Klep, is also a family business, that works together nicely." Another advantage of mixing on arrival in Amsterdam is that moisture can be added directly to the substrate. "It always works better than when it is done at the grower. Now the moisture can immediately be absorbed well during transport, with which you also make good use of the transport time as it were." Besides moisture, they also see at Klep that plant enhancers, organic materials and bacterial preparations are increasingly being added to substrates. Nol: "You can see that crop protection products are now under pressure and that increasingly more biology is coming into play. A good distribution of the materials is crucial, and that is best done directly at the source." Just like mixing and composing the substrate mixtures, moisture mixing is about customization. "The substrate must at all times remain manageable for the grower, whether it is placed in bags, big bags, big bales or delivered in bulk. Delivery is therefore based on kilos, while the volume in cubic meters remains stable. Having an eye for the state of the raw materials on arrival is also part of that. For example, if there is already moisture in the product, then that is something to take into account." Handelsonderneming C.J. Klep and Substrate Optimaal will be at the HortiContact on 19, 20 and 21 February, in stand N129.